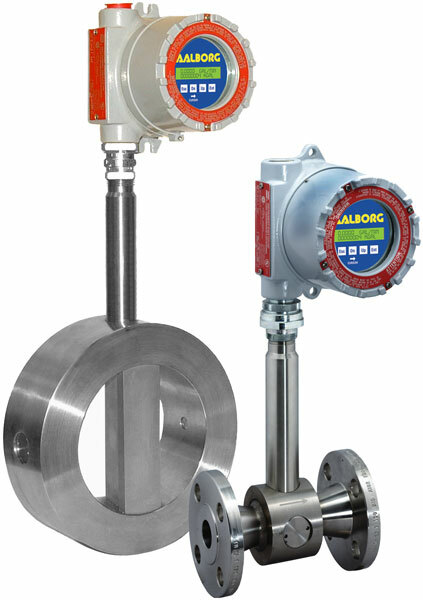 Temperature and Pressure compensated in-line Vortex Flow Meters are designed to indicate flow rates of gases, liquids or steam. Constructed of type 316 stainless steel, Vortex meters may be installed in-line by customer provided or built-in flanges. Key pad or communication interface functionalities include measuring units, programmable flow alarm, two programmable totalizers, programmable flow rate pulse output, two programmable optically isolated outputs, battery backed real time clock (RTC), digital communication interface (RS-232 or RS-485), programmable diagnostic events log and register with date/time stamp, programmable process variable log with date/time stamp, calibration and flowing fluid parameters adjustment, extensive diagnostics. 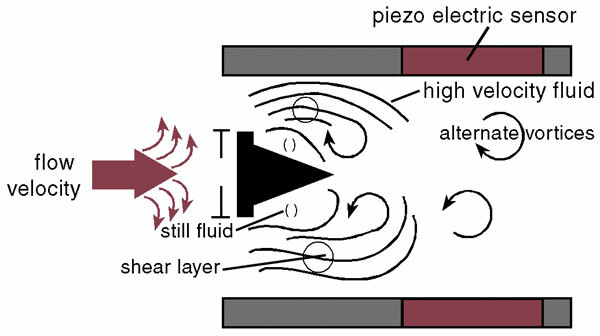 Additionally, the Multiparameter Vortex meter uses a platinum resistance temperature detector (PRTD) to measure process fluid temperature, and a solid state pressure transducer to measure process fluid pressure. The built-in computer calculates fluid density, volumetric and mass flow rates. Local 2x16 LCD readout provides flow rate, temperature, pressure, density, total flow volume reading in selectable engineering units, diagnostic events indication, and feature password protected access to process parameters to prevent tempering or resetting.